Wes Barker’s show features magic, comedy, and stunts. Wes performs around the world at colleges, comedy clubs, and corporate events. 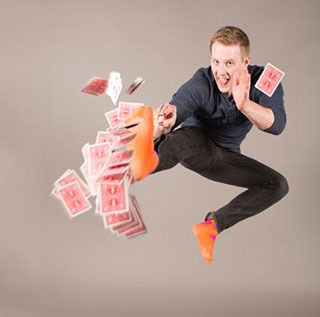 No matter if it’s a stage show for thousands, or close-up magic for 5 people, Wes will blow your mind and make you laugh. There is nothing quite like Wes’ show. It’s full of amazing tricks, incredible feats, and hilarious audience interaction. Basically it is awesomeness from start to finish. But you don’t have to believe us, you can see for yourself! You may recognize Wes from his 27 million views on YouTube, or any number of appearances on TV. In 2015 alone Wes was featured on America’s Got Talent, Wizard Wars, and most recently on the CW hit show Penn & Teller: Fool Us (WINNER). Wes Barker has performed all across Canada, USA, Australia, and Indonesia. From small towns to Las Vegas stages, Wes has got you covered. Noteable Entertainment & Events is a Vancouver based booking agency, party rental, entertainment services and event production company. If you are interested in booking Wes Barker please contact us.